Happy New Year! 2019 is upon us and I, for one, am looking forward to an amazing year! Not that 2018 wasn’t grand, but as spoken by the wonderful pastor at our church, Pastor Jordan Hansen, the new year is a time for reflection and recalibration. In 2017, I wrote a blog about this same time of year about a term called “resetting” from Dr. Roberta Anding from Baylor College of Medicine. She said that resetting was an opportunity to “set again” our habits differently. I looked at it as an opportunity to evaluate every day as it came instead of one, gigantic New Year’s Resolution… which I admit… I was never that good with. Well, recalibration has a similar, but slightly expanded and more spiritual meaning. It is about who you and what you will make a priority in 2019. And how will you find time to fulfill those priorities. 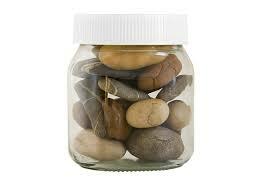 Imagine a jar full of rocks. The rocks represent all of the things that are a part of our lives. The jar is filled with items of importance, meaning, and things that make a difference. The rocks are all different shapes and sizes. The jar can only hold so many things and we (okay, me…) very often find that our jar is overfilling, and we can’t even put a cover on it. There are even things (“rocks”) that are outside of the jar that there isn’t even room for that we desperately want in our jar. Very often the rocks feel like tasks. Lists and tasks… you know what those are. The tasks are often prioritized. And while tasks aren’t wrong, for me, I know I need to be more mindful of the order in which the rocks are prioritized. How do I fit everything in, especially when all of them are meaningful? We all know that life can be heavy. I often ask myself, “How long will it be heavy and what is the meaning of the heaviness?” If I can find the meaning, I can make it through the heaviness because there is something worthwhile about it. The goal is… find the meaning. So, ready or not, as 2019 is upon us, think about your jar. Think deeply (and often this is where prayer comes in for me). If I look at each rock as a priority, I create two piles, “This one is working for me,” and “This one isn’t working for me.” This helps me fill my jar with the priorities that make a difference. Sometimes saying no or not now is the right message. (Don’t get me wrong, it is really hard for me to say no, especially when it relates to helping someone.) But at the end of the day… we can’t help everyone. We hope that the grace of others spreads far and wide to provide that help from other sources. This is where prioritizing relationships comes in. Think about those relationships that you create time for. Are they good relationships for you? Are there other relationships that you need in your life? Are you out there seeking them? So, as we take a deep breath in and let a long breath out…. be intentional about your own reflection and recalibration. Reflect on 2018 (sometimes we want to bask in it… and other times, we want to kick it to the curb and move on) and then get yourself ready for 2019. Psych yourself up for it to be the best year ever, your jar filled with exactly what it needs to be filled with. I am forever grateful for 2018 and for each of you who let me be a part of it with you. My hands are full… and so is my heart. "Helping leaders be their best by finding their greatest strengths and gifts in themselves and in those around them." Copyright © 2017-2019 MWS Coaching. All Rights Reserved.